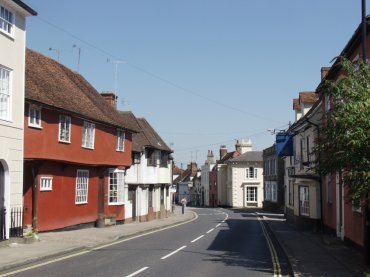 Bradford Street, shown here, follows the route of the Roman road from Chelmsford to Long Melford and Braintree itself was once a Roman town. 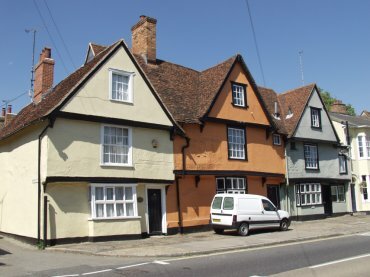 Bradford Street has 65 timber framed houses, a couple of those dating from the 13th century, most of which were probably associated with wealthy wool merchants. These three timber-framed houses on the corner of Woolpack Lane in Bradford Street, of double jettied construction, used to be The Woolpack Inn. The buildings at each end were built circa 1590 and the central section around 1660. This rear extension of the building above, seen here from Woolpack Lane with Bradford Street at the far end, was built about 1450. Most of the original frame is complete but the roof was rebuilt in the late 16th century. 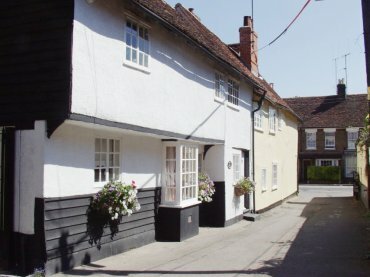 Canes or Bocking Mill is at the bottom of Bradford Street where it crosses the River Blackwater and dates from 1580. 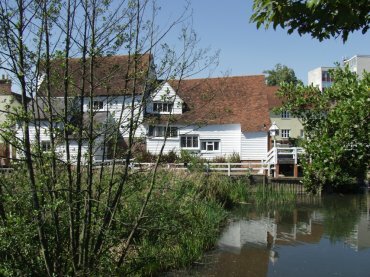 It was originally used as a cloth mill, then later as a fulling mill and finally as a flour mill. It is now used as a domestic dwelling. 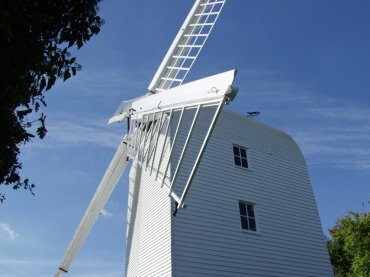 Bocking Windmill is about two miles from the town centre in the suburb of Bocking Churchstreet. Although it can be viewed from the outside at any time it is open to the public only a few times each year. 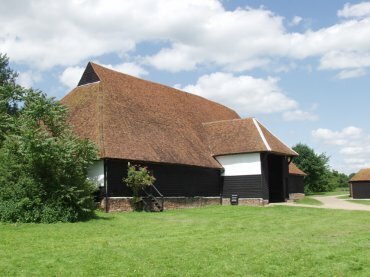 'Barley Barn', about 7 miles from Braintree, is the oldest timber-framed barn in the world and, together with 'Wheat Barn' and other buildings, is part of the historic Cressing Temple Barns site.